Dr. Winter’s current research focuses on sleep and athletic performance. In 2006, Major League Baseball awarded him a grant to study the effect of scheduling and time zone travel on team performance. In the winter of 2008, he was an invited lecturer at the MLB winter meetings in Las Vegas, NV. He has served as a consultant for several baseball teams including the Cleveland Indians, Los Angeles Dodgers, San Diego Padres, San Francisco Giants, Tampa Bay Rays, and the Pittsburgh Pirates. In addition to MLB teams, he has worked as a sleep specialist for NBA teams including the Oklahoma City Thunder, Chicago Bulls and the Washington Wizards as well as NHL teams including the New York Rangers and the Washington Capitals. In addition to professional athletes, Dr. Winter has studied the sleeping characteristics of 560 Division I-A college football players, and works with several collegiate teams to help optimize their sleep. Dr. Winter has also consulted with the Chicago Bears football team, US Women's soccer team and USA Hockey. Athletic Sleep Assessments: Through interviews, Dr. Winter acquires data on academic and professional athletes and completes a thorough sleep inventory and medical evaluation, providing a scientific profile of the team and every team member. Each academic and professional athlete has a personal prescription to achieve elite sleep. Travel Optimization: Dr. Winter develops travel strategies with team managers to lessen the negative effects of jet lag, a major factor contributing to sleep deprivation. By evaluating travel schedules, the impact of crossing multiple time zones or international travel can be significantly reduced. Insomnia Treatment: Dr. Winter works with sleep-deprived collegiate and professional athletes coaching them how to sleep more effectively and feel more refreshed when they awaken. Through cognitive/behavioral exercises, he creates a confident sleeper that is not dependent on medications or alcohol to sleep. Sleep Monitoring and Interpretation: Dr. Winter is a fully board-certified sleep specialist, and arranges sleep study evaluations for athletes identified as having more significant sleep disturbances. Once completed, Dr. Winter explains the results and eliminates the underlying sleep disorder. He also has the capability to perform both short-term and long-term monitoring of individual players as well as entire teams. Sleep Optimization: By using devices such as light boxes, noise machines, specialized sleep monitoring devices and performance sheets and bedding, we improve the athlete’s sleep and proactively address the individual difficulties they are having. Dr. Winter has close relationships with many sleep industry businesses and often gets products for teams at reduced or no cost. Lecturing: Dr. Winter speaks to numerous teams and individual athletes about the fundamentals of healthy sleep and educates them as to how optimizing sleep leads to improved athletic performance. Elite Sleep Research: Dr. Winter participates in novel and original research designed to determine what role sleep plays in athletic performance. Many of the teams we consult with conduct their own internal data collection with Dr. Winter’s assistance. Individual Consultation: Dr. Winter is available for athletic consultation in person, via video conferencing, and via phone. Dr. Winter is also available for telephone conferencing 24 hours/day. As a fully licensed neurologist and sleep medicine physician, his consultations are much more thorough than a simple behavioral sleep evaluation. Please contact our office for more information about these services. 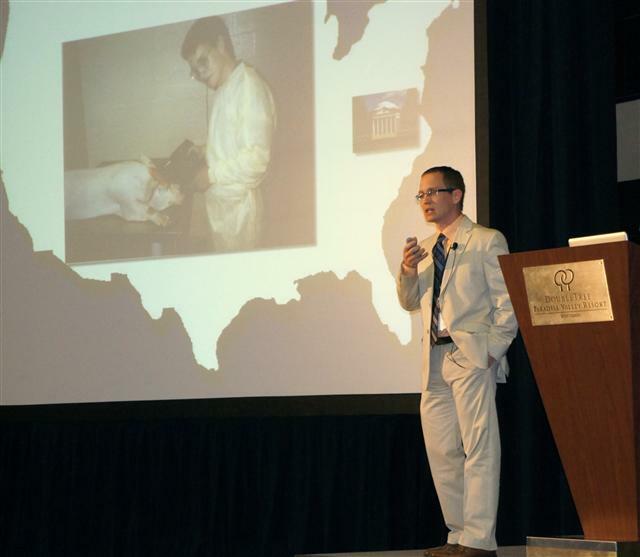 Dr. Winter lecturing at the 2011 3rd Annual Collegiate & Professional Sports Dietitians Association (CPSDA) conference in Scottsdale, Arizona. "Big time athletics is all about word of mouth. If they can understand your message and it works, you will get invited back and they will tell others. Anything short of that and your phone doesn't ring. I know Chris must be doing something right because I keep running intohim all around the country at different teams. I was so impressed with Chris' work that I suggested he speak to all the sports registered dieticians in 2011 at our annual conference (www.sportsrd.org) and Chris was one of the most high rated speakers of the conference. Poor sleep and bad diet are a lethal combination for the immune system of the athlete who can ill afford any downtime. Chris is on top of his game in the world of sleep and recovery." 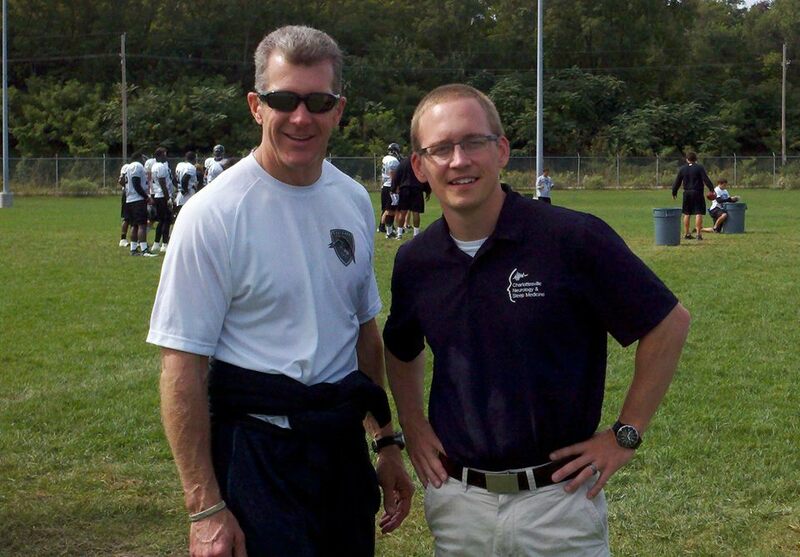 Dr. Winter and Ted Sundquist with the Omaha Nighthawks, 2010 on the training field in Omaha, Nebraska. "In today’s ultra competitive professional sports world, where millions of dollars are invested by clubs in exchange for maximum performance from their players, wouldn’t it make sense to provide those athletes with the very best information and resources to ensure peak performance levels? Even the slightest edge in any area of preparation can mean the difference between victory or defeat, and with the demands placed upon athletes through travel and scheduling, rest and recovery has to be a major concern for coaches and front office management. I’ve known Dr. Chris Winter for a couple years now, closely studying his works and the success he’s had with professional athletes across a very broad spectrum of sports; Major League Baseball, the National Basketball Association and the United Football League. Chris has taken the application of his research to another level and employed it on to the courts and playing fields of pro sports. Guess what? It works. Just ask the San Francisco Giants or Oklahoma City Thunder. It’s why I called Dr. Winter to assist the Omaha Nighthawks of the UFL in their inaugural season (2010). If you’re a head coach, general manager, athletic director, or even owner of a sports franchise looking to gain a competitive advantage over your opponent, you need to speak with Dr. Chris Winter. His knowledge of the physical demands on athletes and how to best assist them in rest and recovery through strategic sleep patterns will put your team on top." "Dr. Winter's approach to sleep and performance has led to progressive changes within Major League Baseball. Chris and I have worked together for the past 3 years when I was with the 2010 World Champion San Francisco Giants and now the Pittsburgh Pirates. Chris provided the medical staff with his expertise on travel for the playoffs which was beneficial to the team. Chris continues to explore the world of sleep for professional athletes which gives our medical and strength and conditioning staff new information to evaluate. The amount of travel that is demanded within MLB, in my opinion, does reflect on the overall performance of the player. Therefore, the work that Chris provides make a critical difference and allows many of us to look deeper into the needs of the player." 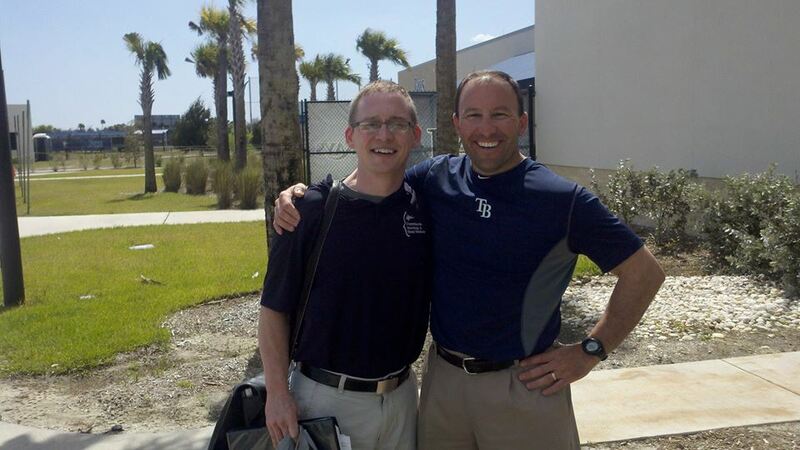 Dr. Winter and Ron Porterfield at the Tampa Bay Rays Spring Training Complex, 2011. "Dr. Chris (William) Winter is one of the foremost SLEEP physicians in the country. His work with athletes and with teams is exemplary. I saw it first hand when he worked with the Oklahoma City Thunder of the NBA. What separates him from the pack is his ability to relate to athletes and thus get to the core sleep issues. Many athletes have sleep problems given the difficulty of winding down after competition plus the frenetic travel schedule. Dr. Winter's cutting edge approach to this vital health care need will be appreciated by any organization which recognizes the correlation of proper sleep to performance." "Dr. Chris Winter has opened my eyes to the advantages of sleep in the aid of recovery as well as the ability to adapt one's self to time changes when traveling thru one or more time zones. He is an expert in the field of sleep and sleep research. In our game of baseball players and coaches struggle to get to sleep after late night games, late night meals, as well as having to get up early for the afternoon games. Our grind of a 162 game schedule, mental stress as well as physical abuse on the body make for difficulty to get the appropriate rest. Chris, has given insight in our efforts to help the players and staff that listen to the advice. I am truly grateful." "You may not be aware of how important sleep is to an athlete's performance.Dr. Winter is able to help any level athlete maximize their sleep under the most adverse or ideal conditions. His work with athletes and with teams is proven. In researching help for both our professional women's basketball team and my young swimming daughter I discovered the work he has done with the Oklahoma City Thunder of the NBA and the San Francisco Giants of the MLB. From individual athletes to team travel plans, Chris understands every facet of the equation. Chris was able to identify our issues causing disruptive sleep, he provided insight the athletes could understand and relate to and gave them a road map to plan for and have excellent sleep. Athletes of all ages struggle with sleep on the road, flying commercial, crossing time zones, playing 7 games in 12 days in 5 different cities or just being a 12 year old out of her own bed. Dr. Winter's personal, hands on way he deals with each team and athlete will help provide for greater success. Any individual or organization that values and understands the benefits of quality sleep on performance and success will value what Chris can do for them." "After Dr. Winter spoke to our team about how important sleep is to the collegiate student-athlete, I have been preaching it to our kids and singing Dr. Winter's praises to other coaches at the University of Virginia. I just talked at length about it at our first team meeting of the new year. He also has given me some great advice on how to handle traveling across time zones, getting proper sleep in new surroundings and in competitively stressful situations." Dr. Winter discusses the sleep of NASCAR driver Kurt Busch in this blog from Basis (May 15, 2014). Read how sleep monitoring is used by this champion driver to maximize his performance. This article from Yahoo Health discusses the role of sleep in building a healthy, athletic body. Read the October 18, 2015 article here. Dr. Winter talks to ESPN's Kevin Arnovitz about the NBA's grueling schedule and the affect it has on player sleep and performance. Read the December 5, 2016 article here. Dr. Winter appeared in the April 13th, 2015 issue of Sports Illustrated in an article about his work entitled, "Nap Time". You can read the full article by Matt McCarthy here. Dr. Winter discusses how sleep and travel affect elite golfers in this April 5, 2015 New York Times Article. Read the full article here. Read about how sleep and jet lag affect elite athletes. The October 27, 2014 Sports Illustrated article by Jamie Lisanti highlights Dr. Winter's work with the NBA. You can read the full article here. Dr. Winter was interviewed during the Giant's road to their third World Series win in five years. Read this October 25, 2014 AP article entitled Sweet Dreams: Sleep Expert Helps Giants in October by clicking here.